COOL! i mean, ya know, poor little thing, but it would still be kinda cool to find it-in a heartbreaking kinda way. that reminds me about when i was in the keys, driving back to miami, we stopped on a bridge to look down in the water to see some cool fish and there was about a million and one little fish in a huge school that looked like seaweed until we realized it was fish, and there was alot of knife fish, and a couple crabs ( i hate those little buggers) and then there was this HUGE manta ray swimming a little ways out. it was awesome! why do you keep talking about cheerleaders?!!!!!!!!!!!!!?!?!??!?! He or she was a test subject, the ray are just getting ready for the biggest army against land. Ok, what's with the cheerleaders????????????? exactly, what about the cheerleaders? Poor manta ray! OoO People shouldn't treat animals like that! Perhaps it fell from the sky. I would paint pigeons purple if I had nontoxic pigeon-safe paint. Rage & Sprig: I agree on the womens' volleyball. Put on more clothes! I hope it's not some sick persons idea of a joke. It's not a manta ray... it's a man-eating rat in disguise! i live in san francisco!!! why didn't i hear about this sooner? what's with the cheerleaders? Take a look - trust me, its worth it!!! As a cheerleader I think that kiki could be one of us be can do spinning backflips in the air and fall from the top of peoples hands. Now I get the whole cheerleading thing! Okay, I have so many posts to cacth up on. sorry I have not posted in a while. Ive been....lets just say busy. If I haden't known about Australian Steve Irwin's (Crocodile Hunter) death caused by a stingray, maybe I would like stingrays... But right now they seem evil, to me. 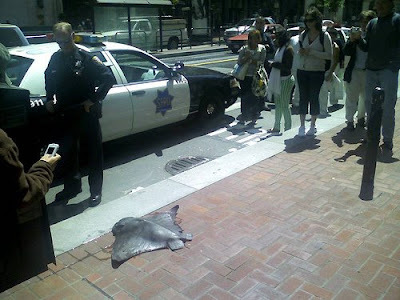 i'm just catching up on your blog, i love manta rays, and this makes me so sad. when we were in hawaii we swam with the manta rays...at night. it was so incredible. they're 14 feet tall!